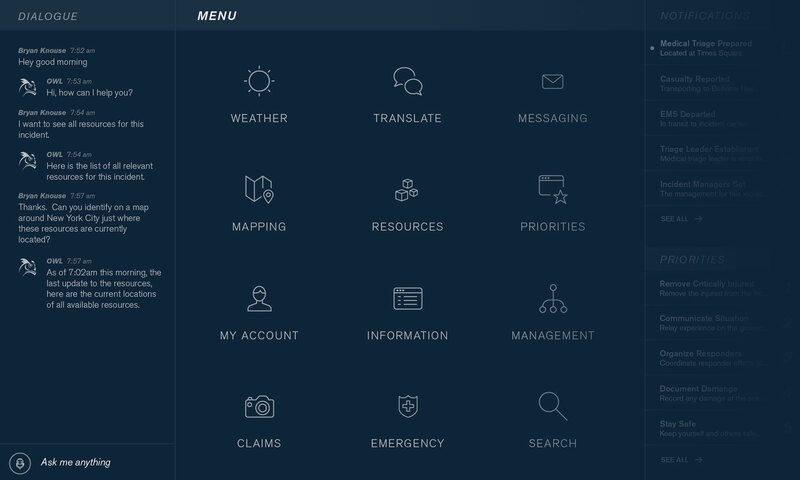 OWL is built to provide first responders a simple experience for managing a disaster. Start by creating an incident (Hurricane Florence) available to all on the OWL platform. Then manage the incident by establishing a leadership structure, communicating with relevant individuals, updating resource allocations and distributing status notifications to the public. OWL accumulates data to paint a clear operating picture of an incident. Data comes from civilians on the Clusterduck network, first responders operating on the management platform, or over a dozen APIs and open data sets from the Weather Company, the Red Cross, FEMA, and others. Leverage all of OWL's incident management capabilities just by talking to it. The conversational interface provides an intuitive experience critical for environments where it is hard to think straight; for the tired and stressed first responders. OWL combines a conversational experience with traditional visual user interfaces to provide a complete, effortless solution. Civilians affected by disasters may log in to OWL and add information about their health, location, and needs. Use mapping to get an overview of the nearby geographic area and supplies. Upload photos of damage to a home, property, or anything else. Use OWL to store this data and save for insurance claims. Connect to emergency services in the area if in urgent need. Access the OWL cloud software through a web browser on a laptop or smartphone. Alternatively, as a conversational agent OWL can be accessed by phone call or SMS text message. Coming to other messaging channels soon.